Fishing is one of every Northlander’s favourite pastimes and at Ara Roa we have several options for the avid fisherman. From The Cliff House, Te Whara and The Glasshouse you can access the coast directly (and exclusively) for a spot of rock fishing. Also with Te Whara and The Cliff House we supply rods and basic tackle. However, for the more experienced we suggest you bring your own equipment. Bait can be purchased at the local shops. There are also numerous great locations in the local area including harbour fishing off wharfs and docks, which can be great fun for younger children. The Jetty at Urquharts Bay is especially perfect for taking kids sprat fishing. Regardless of your level of skills we can always advise you on the best location at the time to suit your purposes. If you want to get serious about it we recommend our local charter firm, Cronin Fishing. These guys are always busy so it pays to book in advance. Feel free to contact us if you would like further info. Professionally provided by Pacific Coast Kayaks. 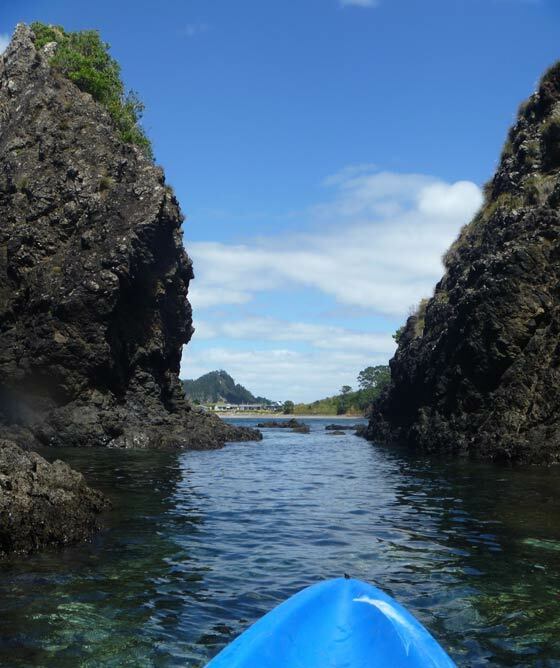 Northland’s Pacific coastline offers you exceptional sea kayaking, snorkelling and fishing. Explore the clear subtropical waters of New Zealand’s warmest region. We access a range of kayak destinations from tranquil harbours and mangrove ecosystems, to adventure kayaking on the open coast and offshore islands. Join us for great scenery, good company, and getting close to nature. First of all experience the best of coastal New Zealand. Explore the lovely Taiharuru Estuary. Ride the incoming tide up this pristine waterway with its clear waters and sandy bottom. The estuary is home to many different species of bird, and furthermore under the surface it is not uncommon to see eagle rays gliding over the sand below you. Small fish skim across the surface, seems like they are chased by the larger ones below! In some parts, native forest and grand old Pohutakawa trees line the shore. Contact pc.kayaks@gmail.com for your tailored kayak experience. Half or full day excursions available. Try your luck at fishing while on your expedition. As a result you could be bringing dinner home!